A. You may be surprised to learn that sometimes urban legends surround seminary rectors. I’m sure no one is more surprised than the seminarians among us this evening. At any rate, the story is told of a rector who was also a bishop and he was indeed a very grand bishop, at least by all accounts. 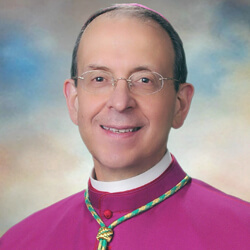 Like all rectors, he gave periodic talks to seminarians, talks known as “rector’s conferences”. B. During one of his rector’s conferences, this bishop uttered words which were nearly immortal, at least to my generation; he said: “Gentleman, I am nothing! And you are less than nothing!” I would say that this rector took self-abnegation to a whole new level. What could it mean to be “less than nothing”? A. However humorous the bishop’s formulation was, he was actually getting at a fundamental truth in the spiritual life, a truth which is captured for us in tonight’s Gospel. After predicting his own rejection and death, followed by the resurrection, Jesus spoke to us these words of everlasting life: “If anyone wishes to come after me, he must deny himself and take up his cross daily and follow me.” In these opening days of Lent, the Lord confronts us with the high cost of discipleship. B. Let us pause over his words, beginning with these: “Whoever wishes . . . “ Discipleship is not merely a matter of one’s being born a Catholic or growing up in a Catholic atmosphere – something increasingly rare. No, discipleship is the result of a personal decision to follow Christ even if we are not fully aware of what that will eventually mean for our lives. C. And the word “follow” doesn’t merely mean that we tag along in Jesus’ company as if we were passive spectators to his teaching, his miracles, his paschal mystery. No, the way to follow Jesus is to “deny” ourselves – to renounce ourselves, in effect, to “disown” ourselves, to admit our nothingness before God, to engage in what spiritual writers indeed used to refer to as “self-abnegation”. This involves letting go of our private agendas, our attachments to sin – indeed, our very lives. This notion of discipleship is indeed radical for it brings us to the root of what it means truly to follow Christ. Following Christ is sharing the Cross of Cross – in word and sacrament, in the Church, in the world, in our personal lives, in the depth of our souls – even in our bodies. A. In light of this Gospel, we can understand better what Moses said to us in today’s first reading from the Book of Deuteronomy. Here Moses urges us to obey the commandments of the Lord, to walk in his ways and to forsake every form of idolatry in our lives. In urging us to follow the law of the Lord, Moses is not reducing discipleship to a set of rules. Instead, he is laying out for us what it means truly to deny ourselves. B. For we can easily say to the Lord, “Yes, I am willing to deny myself and to follow you!” while at the same time going about business as usual. The commandments permit us to engage in no such facile self-deception. Instead, they guide us in the process of denying ourselves, they help give specificity to the ways in which we cling to the allurements of sin and to sinful attitudes that hinder us from following the Lord. So Moses sets out the law for us not as mere rules to be observed but as ways of listening to the Lord, walking with the Lord, and as a sure source of guidance in emptying ourselves of anything contrary to the Gospel. C. Moses taught that following God’s commandments would lead to a long life, indeed, a life of contentment on the land God promised his people. But Jesus promises us more. He promises that if we die to ourselves, we will live forever. He promises that if we deny ourselves, we will share in the joy of his Kingdom. The path to such joy is taking up our Cross and laying down every encumbrance of sin. This is how we follow the Crucified One whose death, paradoxically is the source of the fullness of life and joy: “Whoever wishes to save his life will lose it, but whoever loses his life for my sake will save it.” Many people seek to gain the whole world and lose everything. We are called to lose everything for the sake of gaining Christ – for we are convinced that we are blessed to the extent that we are his faithful witnesses. This is why when we engage in denying and emptying ourselves, in picking up our specific cross with a genuinely willing spirit, we find a peace and joy the world cannot give and we find new strength and courage to bear witness to the Lord in our daily lives. A. Since this is already the second day of Lent, I presume that most of all of us have devised some sort of a plan for this season. We may have mapped out a program of prayer, self-denial, and charity – and I would surely encourage we enter this season with such a plan. But that plan will be incomplete to the extent that we are unaware of the specific ways we need to deny ourselves and the specific crosses which the Lord is asking us to assume. May God bless us and keep us always in his love and grace!